High Intensity Discharge (HID) unit armed with higher electronic technology is gradually replacing halogen lamp in car market, not within the luxury sector. 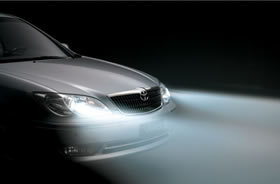 HID unit uses xenon gas to produce more light although it dissipates less power. Therefore driver's safety is improved at night with lower power consumption, higher light output and much longer life. IFTIM HID lamps can replace halogen lamps on any car model,such as H1,H3,H4,H7 as well as 9004,9005,9006,9007 etc.IFTIM provides a wide selection of color temperature from 4200K to 12000K. Engineers in IFTIM have an eye for making HID conversion kit. Every single lamps are examined at IFTIM's factory. So reliability and quality are controlled in the process of manufacturing HID conversion kit. IIFTIM provides high quality, high performance automotive HID lamp for customer's demand with more competitive price. HID conversion kit is composed of HID bulb, ballasts, and wiring harness that used to retrofit the conventional halogen headlamp system into the HID xenon headlamp system. IFTIM provides HID lamps, ballasts basically. In addition to these main item, power cables, brackets, double-sided tape, tie-wrap etc are included. And installation manual, warranty are also provided . HID xenon lamp have a variety of color temperature. The higher the color temperature of the lamp is, the light color is seemed to be more bluish. On the contrary, the lower the color temperature is, the light color looks more reddish or yellowish. The color temperature of 4000K to 8000K is generally used on civil vehicles. The lamp with the color temperature of more than 8000K takes the small portion of the market because the higher color temperature is, the total brightness is decreased. The color spectrum similar to the xenon lamp color is shown below. One who wants to convert the halogen lighting system into HID lighting system should be aware of the lamp type. The HID lamp type should be selected as to agree with the halogen lamp type. It is important to notice that if the lamp type is not correct, installation may be impossible, even you may spoil the HID lamp. If you decide to substitute the HID lamp for the halogen lamp, the color temperature of the HID lamp should be selected in the first place. The color temperature of 4000K to 6000K is reasonable for the night drive or better sight. And the 8000K is recommended as its bluish look. As the second stage, the lamp socket type should be selected. Refer to the lamp type table according to your car. Contact the expert or garage if you don't know what type of the lamp is in your own car. Shuts-off within (1) second if no start or if output is shorted. 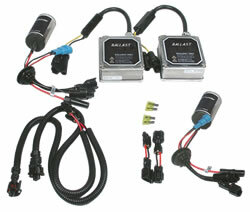 The ballast is a essential part of the HID convesion kit to ignite and control the arc in the lamp. Therefore the output of the ballast is connected to the HID lamp and the input of the ballast is connected to the battery. To retrofit the halogen system to the HID lamp system, use the existing power connector in the lamp housing to feed the ballast, that is, the existing source in the lamp housing can be connected to the ballast's input instead of connecting the ballast's input to the battery directly. Installation diagram is shown left.